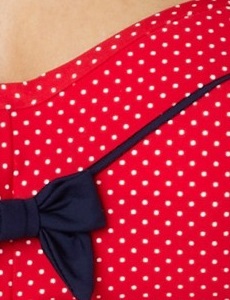 This nautical range in a red & navy mini spot print offers the complete fifties look. With solid navy piping detail to frame the shape of the bust. Channel vintage glamour in the Panache Britt Halter Swimsuit. Designed with a mini spot print, this Britt range by Panache halterneck swimsuit creates a show-stopping silhouette with a skirted front and low leg back for true fifties style. What has a tankini, swim dress and one piece wrapped in one? The stylish and versatile Panache Britt Underwire Halterneck Swimsuit! Now available in Navy Only!!! New Swimwear season, the Panache Britt Halter bikini top. Styled on the popular 50's look Panache Page range from a few seaons ago, the underwire bikini top fastens at the back with a clasp and around the neck with a tie..
Nautical inspired bikini Perfect for Summer, the Panche Britt swimwear range offers a nautical feel in a red and white minispot print with a touch of 1950's styling. the Bikini bra has a 3-part, lined, underwire cup have transversal and center vertical seaming for shape and support. The top cup edge is elasticated for a more custom fi with a center panel - The Arched center panel has two decorative buttons. Power mesh-lined sides and back have sewn-on elastic edges for custom fit. Side boning for additional support. Covered elastic halter straps tie at back of neck. Rear Clacp is a plastic barrel closure. Perfect for Summer, the Panche Britt swimwear range offers a nautical feel in a red and white minispot print with a touch of 1950's styling. We love the contrast piping in navy and the gorgeous bow on the front. Based on the same shape as the much loved Panache Page from previous seasons, the swimwear is now available up to an H cup. The bandeau top has removable straps and light padding in the cups. Available in cup sizes D to H.